Extremely cold with fresh breezes. Visibility was surprisingly good. After a couple of days holed up in the cottage we were keen to get out today and despite the freezing temperatures we made the short journey over to High Row at Dockray to tackle Clough Head and The Dodds and come back via Dowthwaitehead. As with any plan, it was always susceptible to the weather and our itinerary changed - more later. 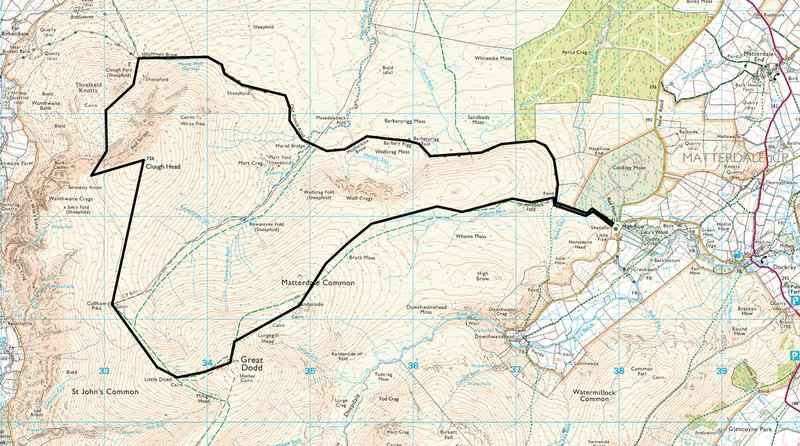 Fully wrapped up, we made our way along the Old Coach Road as far as Hausewell Brow and then climbed Threlkeld Knotts. From here there is quite a stiff pull up to the summit of Clough Head but the views from the top were glorious - it feels as though you could almost touch Blencathra. There was just a smattering of snow on the summit therefore we carried on to Calfhow Pike and on to Great Dodd. The summit was all ice and made for very tricky walking therefore we cut our losses and gave up plans to walk to Watson's, Stybarrow and Hart Side. Instead we headed North East over Matterdale Common to meet the Old Coach Road at Groove Beck - we would probably have been struggling for light anyway therefore it made the decision easier. The descent was tricky as the path was covered in snow making it a guessing game as to how deep your feet would sink in to the snow. This made for a few comedy moments but we kept our sense of humour and made it safely down to the beck. From here it was a simple stroll along the path back to High Row. Whilst the conditions today looked fairly benign it just goes to show that whilst it may be ok at the bottom of the fells it may be completely different at the top. If you have the slightest doubt then it is best to get off the hill as soon as possible - and we did. Driving back to Glenridding, we stopped off at Ullswater and took some photos of the lake in superb light. There are a few of these below. It was a bit nippy today! Summit of Great Dodd with Stybarrow Dodd in the foreground.